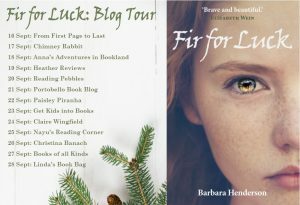 Nature is such a big player in my children’s novel Fir for Luck that I even argued it should be on the cover of the book! The land is part of Janet’s identity. 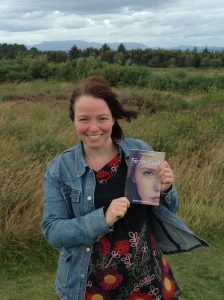 It was a challenge, when writing Fir for Luck, to get across how tightly wound up Janet’s and her village’s identities are with the land. But maybe the land didn’t need to be on the cover after all. Maybe the connection could be shown more subtly than that. *(1) I thought about all the ways that Janet’s environment featured in her everyday life. In the jobs she had to do: checking on the fields, grinding grain to flour, taking cows up the hill to better pasture, mucking out the byre. 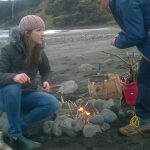 In her home: hearing mice rustle in the thatch above as she sleeps on a straw mattress beside the hearth. Being made to drink nettle brew when ill (one of my more fun research facts). And finally, the title sprig of fir as a symbol for luck, wound into a new hearth chain. The area around Durness where all this took place is barren and almost tree-less. A sprig of fir was not easy to come by. Again, it felt that nature itself played a part in Janet’s fate: the sprig is a motif which features throughout the book. I am a would-be-outdoorsy person. My husband and I are not one of nature’s innate sporty couples, but we do take our children*(2) on holidays to Skye, to Harris, to the wildernesses of Western Ross and Sutherland. 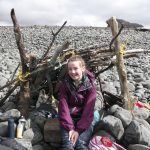 There, our young people can enjoy searching for crabs under rocks, exploring empty beaches, building driftwood beach dens – and being dragged up a few too many hills! 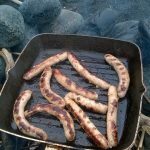 The stuff our children’s childhood memories are going to be made of: bonfire kindling, a blackened frying pan and the thinnest sausages you can buy (so that they cook before they char) – that is an essential part of kit for a fab day out. Of course it was on one of those ‘back to nature’ holidays that I came across the ruins of Ceannabeinne, a little known clearance village. Is Ceannabeinne a real place? Ceannabeinne really existed as a thriving township. All that is left now is rubble and ruins of course, but the burn still trickles through. It’s just east of Durness, the nearest village to Cape Wrath, the most northwesterly point of the UK mainland. Durness is a village now, but at the time it was made up of townships such as Durine, Sangomore, Balnakeil and of course Ceannabeinne. No place in the whole story is invented, and the key events all really took place there. And a final word… I know; not every reader of Fir for Luck will visit the amazing place where my character made her home, although they should if they can.So instead, let any outdoor bonfire take you to the ceilidh in chapter three. Listen to the sound and scent of the sea and hear and sense Ceannabeinne. Let every dark night take you there. That way, you can peek into Janet’s world. 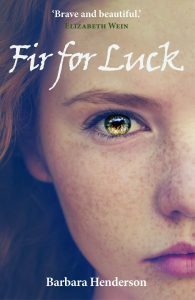 Find out more on the authors website You can buy Fire for Luck here. *(1) There are hints of nature on the cover of the book with the fire in Janet’s eyes and the pine cones on the back. Publishers Cranachan decided against landscape in the end, and Barbara agrees as: “Young readers are most likely to care about the central character, and about the worst thing that can happen”. •(2) Barbara has 3 children, who are now 11, 14, and 16 and they are in some of the pictures.